An old Alpine chalet of the late '600 with warm and reassuring atmospheres, located at 1.400 meters above sea level and harmoniously inserted in the uncontaminated nature of the meadows and woods of the Alta Valle Camonica. The Chalet is located in the heart of an old rural village in the hamlet of "Cormignano", located in a large clearing point of rare beauty with breathtaking views of the surrounding glaciers, from Adamello to the mountain group of Baitone. 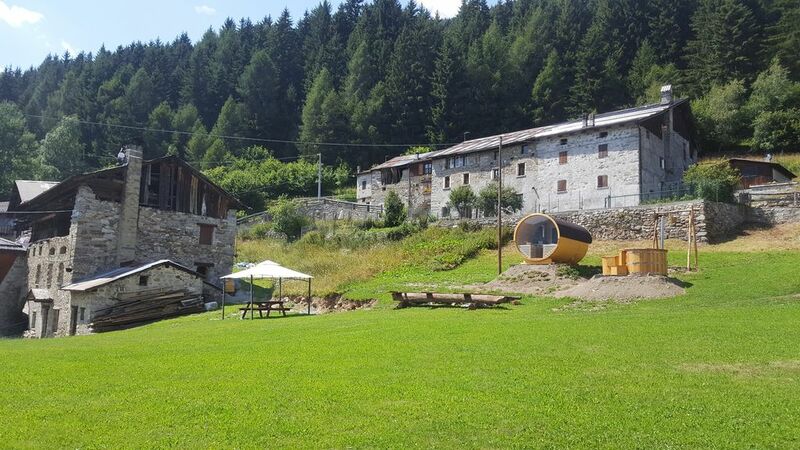 The property is 3 km (5 minutes by car) from Vezza d'Oglio (province of Brescia - Alta Valle Camonica), 12 km from the renowned center of Ponte di Legno and 7 km from its ski area (with over 100 km of slopes) . Renovated for the first two floors (renovation being completed but already enjoyable), the Chalet is a perfect combination of tradition and innovation, history and technology. The entrance to this authentic mountain chalet is an original wooden door, enclosed by walls, ceilings and stone floors. Created inside the ancient stable, the large living room (about 50 square meters) allows you to immerse yourself in times past. The vaults of the stone ceiling, the flame of the stove, the sought-after lighting, give an authentic atmosphere. On the ground floor there is a large kitchen, equipped, anteroom and separate bathrooms with access from the living room. Outside the hut, in the large private garden for private use, a barrel sauna with panoramic glass, tub with whirlpool, Scottish shower and Solarium can distract you for a break from the rhythms and frenetic thoughts. After a walk in the woods where the walk is light between the soft mosses under the green and relaxing fronds or returning from a day of skiing, enjoy the sunset lights, in the silence surrounded by the warmth of a sauna gives a moment of relaxation. During the winter season in the presence of snow, the road is not cleaned up to the Chalet. Depending on the snow cover it may be necessary to walk for max 15 min. Luggage and suitcases will be transported thanks to a jeep or other means. The Chalet's exclusive location offers the possibility of profound immersion in nature to counteract the effects of a stressful lifestyle. WINTER / SPRING SEASON from alpine skiing (the Ponte di Legno area - Tonale with over 100 km of slopes is only 8 km away) via ski mountaineering to snowshoeing in the surrounding woods. SPRING / SUMMER / AUTUMN SEASON Among the various paths that characterize the area are recommended walks or mountain bike excursions (with the possibility of ebike rental). Starting in July it is possible to collect mushrooms nearby while. ALL SEASONS Breathing: mountain air is good because it is drier, has a lower concentration of pollutants and stimulates tissue oxygenation. Relax: the isolation and the silence of the mountain help contemplation and general relaxation, giving greater inner serenity. The E-BIKE RENTAL service is now active directly from the Chalet. The Neuron: ON models are equipped with 29 "wheels to give agility and maneuverability on every course. The 2. 6 "tires offer excellent traction and are perfect for intensive use of an e-MTB. More compact and one kilogram lighter than the competitors' products, the Shimano Steps E8000 engine combines with the agile geometry of the Neuron: ON to revolutionize the concept of e-MTB. The geometry of the Neuron: ON is more comfortable. The result is a sensitive suspension system with 130 mm of travel that can be exploited to its full potential.